Plan Ahead: Many of our outpatient services fill up fast, so call to schedule early. Where to Go: If you have an appointment, come to Craig’s newly renovated West Building and check in at the Outpatient Admissions desks in the first-floor lobby. All outpatient visits check in at the front desk in the first floor lobby of the West Building. Where to Park: Craig provides two parking lots for outpatients and visitors. The main parking lot is at the corner of South Clarkson Street and East Girard Avenue, just to the north and east of the West Building entrance. An additional lot is located at the corner of Old E. Hampden Avenue and South Emerson Street, just south and east of the hospital. Where to Stay: Priority for Craig’s onsite family housing goes to those living more than 60 miles from Denver. You must coordinate your stay with Guest Services prior to your arrival. We recommend calling at least six weeks before your visit. For reservations, please contact Guest Services at 1-800-835-7052 or 303-789-8365, or email guestservicesmg@craighospital.org. Craig also has a partnership with many local hotels for discounted lodging rates for our patients and families. Stay Healthy: People with open wounds are asked not to come for their Interdisciplinary Outpatient Evaluations because it can be detrimental to their health to be sitting on a wound. If you have an open wound, please seek help at a wound care center. 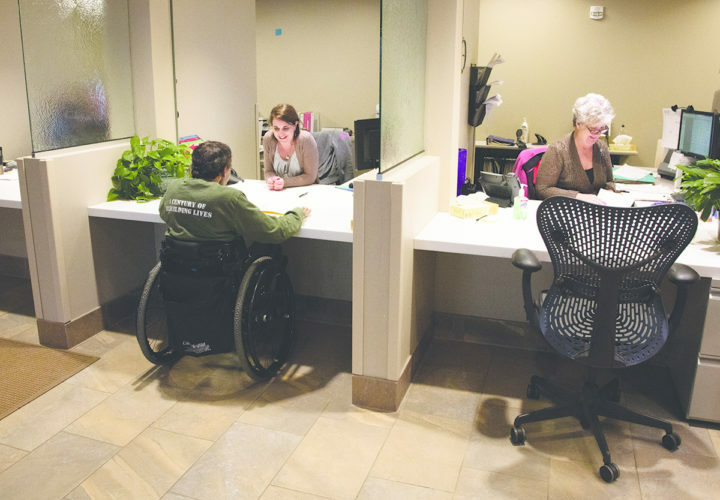 The PEAK Wellness Center: The PEAK Wellness Center at Craig Hospital is an adaptive health and wellness center serving individuals from across the country with neurologic disabilities in order to optimize their recovery and create a lifelong plan for their health and wellness. For membership please call 303-789-8325.